1. Prep the chicken and vegetables: Rinse a whole chicken (about 4 lb.) and pat dry with paper towel. Cut into 10 pieces and then sprinkle generously with salt and pepper, about 2 tsp. and 1 tsp. respectively. Core 2 red bell peppers (about 1 lb.) and cut in 1/2-inch dice; finely dice 1 Spanish onion (about 3/4 lb); smash 2 garlic cloves and chop 2 tsp. fresh thyme. Stem and then coarsely chop 1 bunch Tuscan kale. 2. 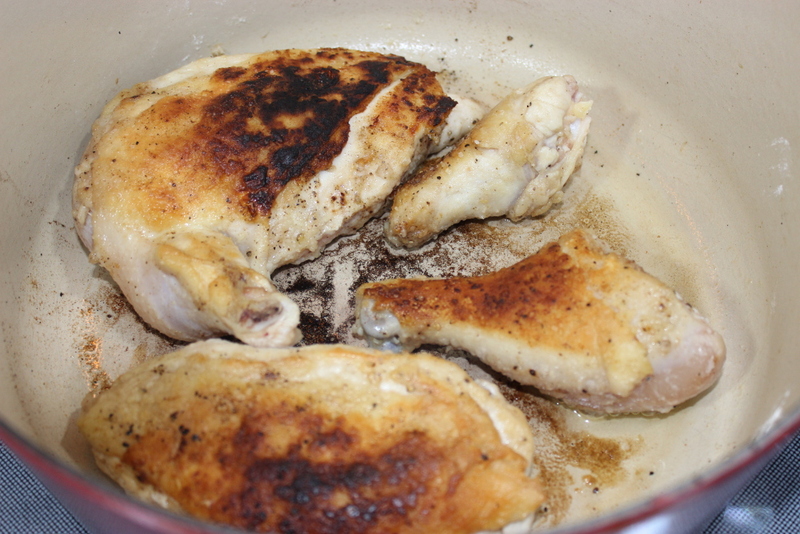 Saute the chicken: Add 1 cup all-purpose flour to a shallow bowl. 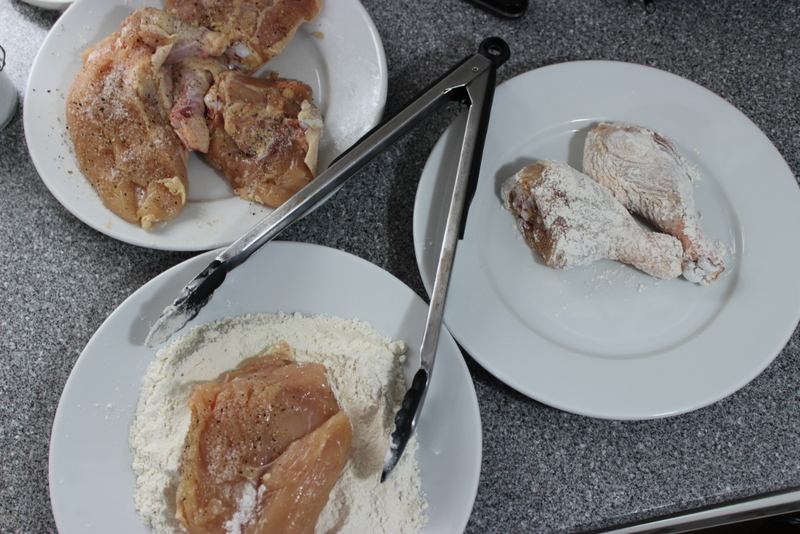 Dredge the chicken in the flour and shake to remove any excess. Add 2 Tbs. olive oil to the pre-heated pot and reduce the heat to medium. 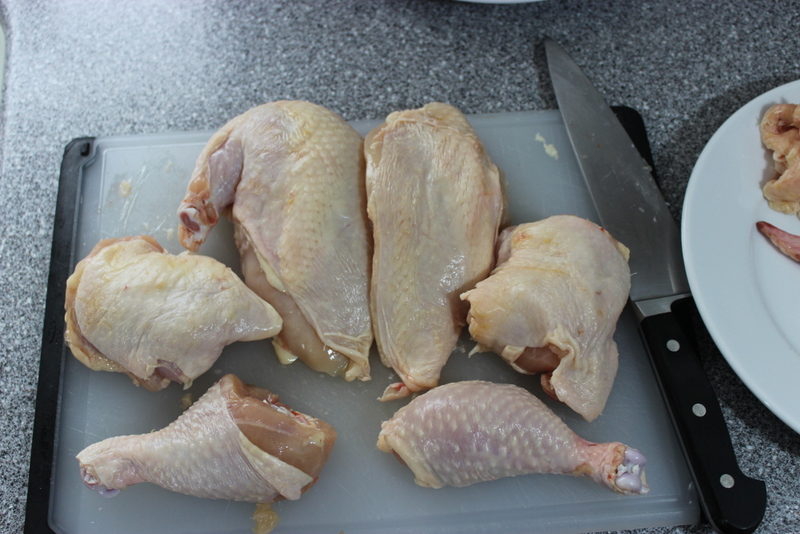 Add half of the chicken, evenly spaced. Cook, undisturbed, for 2 min, so the chicken browns and easily releases when you lift an edge. Flip and cook the other side for 2 min so that it, too, browns. Transfer to a large plate. Add another 1 Tbs. 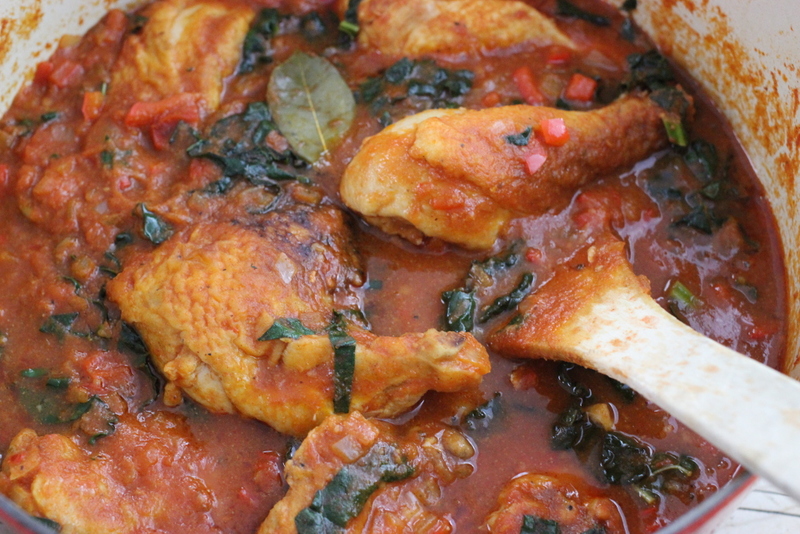 olive oil and the remaining chicken pieces, cook in the same manner, and transfer to the plate. 3. Saute the vegetables and make the broth: Add another 1 Tbs. 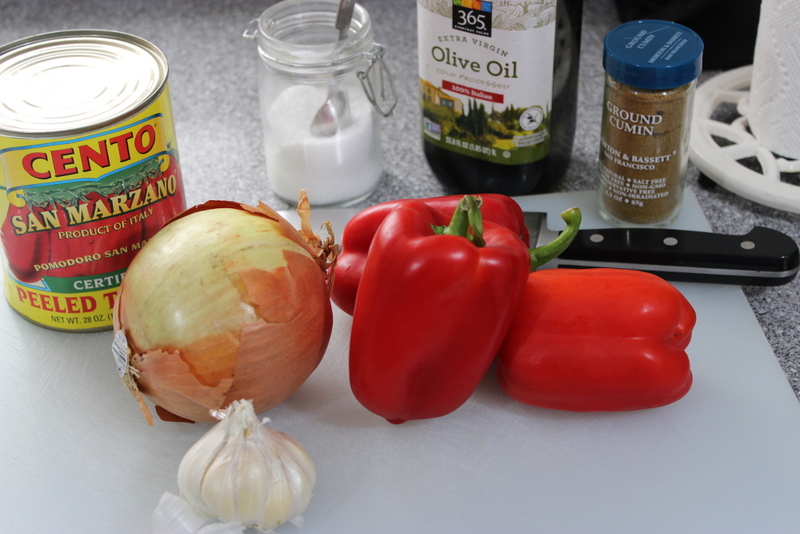 olive oil to the pot and the diced onion and pepper. Sprinkle with 1 tsp. kosher salt and cook, still over medium heat, until the onions brown lightly and soften, about 10 min. Add the smashed garlic, 2 tsp. 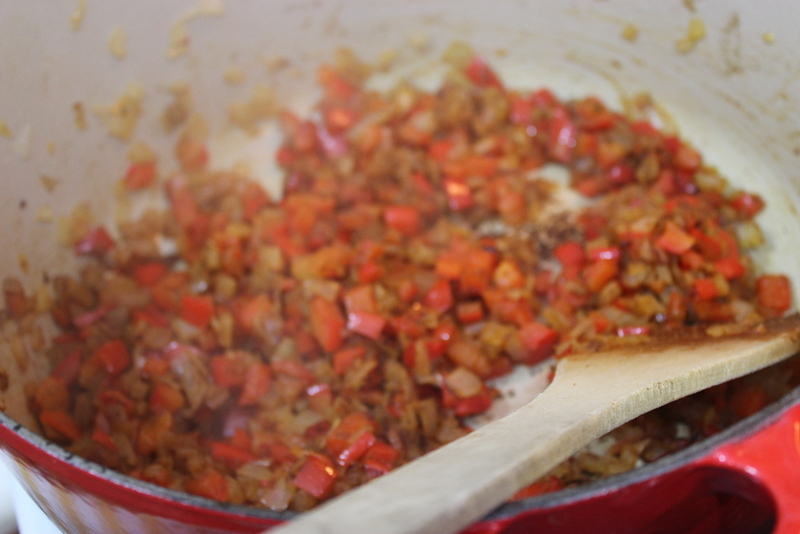 ground cumin and 1/2 tsp. espelette pepper (or 1/4 tsp of pimenton or chipotle powder) and cook, stirring, for 30 seconds so the spices become fragrant. 4. 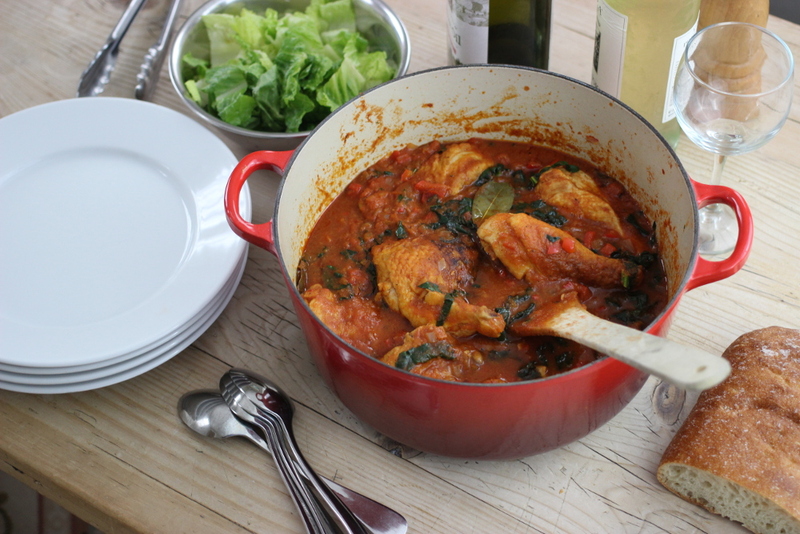 Braise: Add a 28-oz can whole tomatoes (pureed) and 2 bay leaves and bring to a boil. Reduce to a simmer (medium-low), return the chicken to the pan, cover, and cook, checking every 15 minutes, until the chicken is completely cooked through and the broth intensifies in flavor, about 1 hr. 4. Season and serve: Stir in 1 Tbs. sherry vinegar and the Tuscan kale and stir until the greens wilt. Season with S+P to taste and serve.